A quality multitool could make the difference between tightening or adjusting a bolt and getting on with your ride, or struggling with a misaligned component or dangerously loose clamp. The Pro Bike Tool Multitool is a lightweight, beautifully machined stainless steel tool; built to be reliable, long-lived, and stylish. 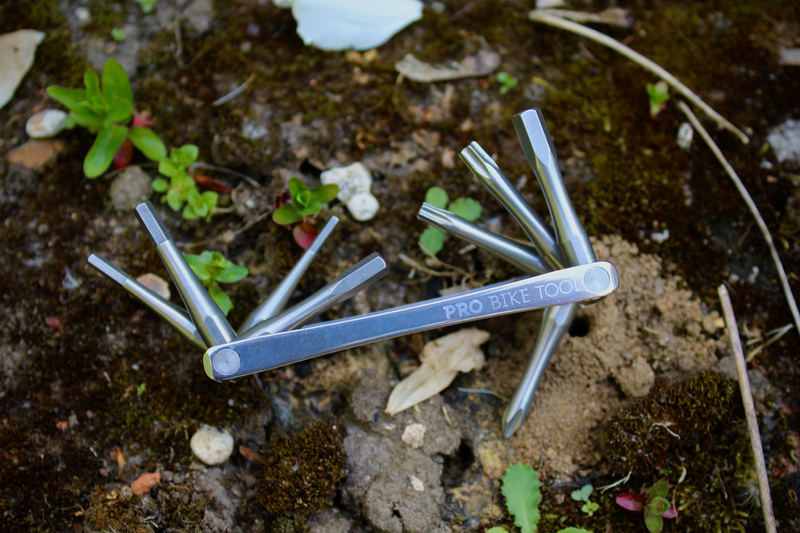 The Pro Bike Tool Multi-tool is only 0.7 cm thick, 9.4 cm long, and weighs just 99 grams. Machined from SUS420 Stainless Steel, it is one of the highest quality alloys that you can get, and the brand guarantee it will remain rust-free. It certainly looks the part, and has 8 of the most useful tool bits that you need for road or trailside repairs; including Allen/Hex 2.5/3/4/5/6, Torx T25/T30, and a Phillips PH1 screwdriver. The only thing it is of course missing that I always recommend taking on a ride is a chain-tool; but Pro Bike Tool make a separate one of these, which I may review on the blog sometime soon, having seen how good quality this tool set it. One of the stand-out and nicest features of the tool is its size and auto-indexing locking bits. This means that the tool bits semi-lock into position when they are flicked up, which makes tightening bolts a lot easier. The tool is a good length too, to get a decent bit of leverage. You can get multitools that feature 20+ tool bits, but the more you add, the bulkier they get; and more bulk makes them cumbersome to use, and not conducive to reaching into small spaces on a bike frame. This seems to be a great size tool to me. Beautifully made, and a pleasure to use. This is another winner from Pro Bike Tool.